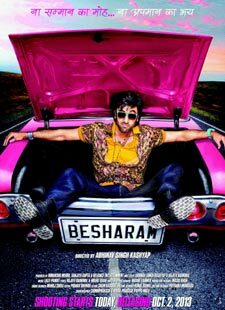 The party song of Besharam has been released. The music of this song is given by very well known Lalit pandit and the melodists of Chal Hand Ke Nache are the rocking Sunidhi Chauhan, Mika Singh and Daler Mehndi. Here you will find the complete Lyrics of Chal Hand Utha Ke Nache in Hindi and English Translation with its HD video as well. Par hum bhi nahi kachche..
Mike pakad ke aaj macha de halla halla..
Pakad ke finger tu pehna de chhalla chhalla..
Hum desi jitne, dude bhi utne hain sachche..
Oye fikar chhod ke sharam phaad ke nachche..